Recreated wetlands at the Irvine Nature Center that help to clean and slow down the Jones Falls. Jones Falls flood gauge near Clipper Mill Road in Baltimore. Damaged stream restoration on Stony Run in Remington. The Jones Falls works its way through Baltimore, usually out of sight, out of mind. Until it isn’t. Like when tens of thousands of gallons of raw sewage wind up there, or when it floods its banks. In May, the same storm that devastated Ellicott City led to evacuations in the Clipper Mill area along the Jones Falls. Storms are more intense and happening with more frequency. Grove said a couple of inches of rain can increase the water level in the Jones Falls 6 to 8 feet. That doesn’t just threaten nearby roads and buildings. Stan Kemp, director of the University of Baltimore’s environmental sustainability program, said the raging waters wipe out living things in the falls. “So, the fact that the Jones Falls goes from 0 to 60 in half of a second, in terms of flooding, is a huge impactor on the ecosystem,” Kemp said. And this may be the new normal. 2018 is the wettest year on record in Baltimore. And The National Climate Assessment released last month predicts climate change will trigger more intense rainfall in our region in the future. With the possibility of worse flooding ahead, the story of how to control the Jones Falls begins at its headwaters, in rural Baltimore County. Perhaps its most northern headwaters is at the Irvine Nature Center in Owings Mills. It’s a trickle. You can easily step across it. But, even here, stream restoration work is being done. Crews have created pools in the stream to trap runoff from the Garrison Forest Veterans Cemetery next door, like fertilizer, pesticides and sediment from grave digging. “Because if you don’t stop it here, it just keeps going downstream,” said Brooks Paternotte, the executive director at the nature center. Downstream from the Jones Falls, to the Inner Harbor and eventually to the Chesapeake Bay. The nature center has also restored land that had been used for farming back to wetlands. Rob Mardiney, the center’s education director, said that acts like a natural brake to slow down the Jones Falls as well as to clean it. All well and good at the nature center. But slowing down the Jones Falls downstream won’t be easy. Much of the land along it is privately owned. And in urban areas, there’s little room to rebuild lost wetlands. The Jones Falls watershed is 60 square miles, stretching from Owings Mills to Towson, then narrows as it plunges through the city to the harbor. That’s a lot of concrete, with water flowing off impervious surfaces and eventually ending up in the falls. If you live in the watershed, the water pouring into your neighborhood storm drain goes there. 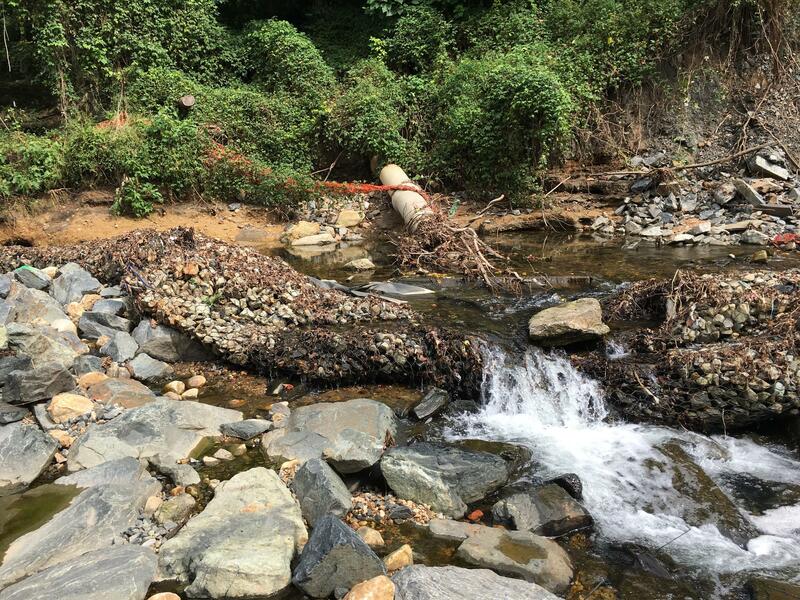 “This high, flashy flows, plus the runoff with it, this is the condition that a lot of urban streams have and Jones Falls definitely falls into that category,” Kemp said. So, the city is looking into some innovative ways to control rainwater, like perhaps collecting it in a large cistern. But this is conceptual, maybe-down-the-road stuff. For now, the city and county are both doing stream restoration projects along the falls and its tributaries. But the jury is out on whether they are helping much in slowing down or cleaning up the falls. Barbara Johnson, a water quality scientist with Blue Water Baltimore pointed out one restoration at Stony Run in Remington that had taken a major hit from raging waters. More than 100 years ago, city engineers did something that’s proven to be more permanent. They buried the Jones Falls for more than a mile, channeling it into tunnels that start just below the Howard Street Bridge. The falls emerge at the Port Discovery Children’s Museum, then flows above ground a few blocks to the harbor. “So, the idea was, ‘Well, we can tame this thing,’ and that was through channeling, putting cement around it,” said Kurt Kocher, a spokesman for the city public works department. And buildings and roads on top of it, including the expressway that bears its name. This was also a way to keep the falls, which at the time was way more polluted than it is today, away from people. A couple of years ago, Adam Lindquist, director of the Healthy Harbor Initiative for Waterfront Partnership of Baltimore kayaked into the tunnels from the harbor to see what was up. By the way, he does not recommend doing that _ it’s not safe. Lindquist found three huge tunnels, big enough that you could drive a bus through each. Lindquist says about a mile in, his group halted, when the path got steeper, and as the water changed from tidal to fresh. Later this week, what you can do to help control the flooding in the Jones Falls, or in any stream. Tuesday, in part 2 of “Fighting For the Falls,” we look at the cleanup of the falls, and the creatures that still call it home despite the pollution. Once a month, Barbara Johnson makes her way to the banks of the Jones Falls. Johnson, a water quality scientist with Blue Water Baltimore, tests the water at more than a dozen sites along the falls and its tributaries, from Stevenson Village near its headwaters in rural Baltimore County, to just where the falls goes into underground tunnels near the Howard Street Bridge in the city.